Likizo is a vacation, and I have just returned. It was sort of a working likizo, but that’s ok, I don’t vacation very well anyway. Besides, I’d be hard pressed to figure out what I would be vacationing from. I needed to update my visa, so I did like I always do and went to Malawi for an overnight at the Beach Chamber. 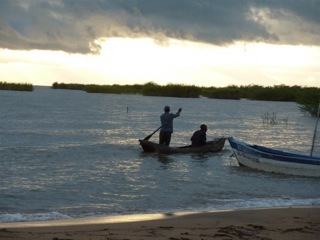 This is a little place not far from the border, right on Lake Malawi. The rooms are nice, there’s a TV with three stations, and the beer is cold. 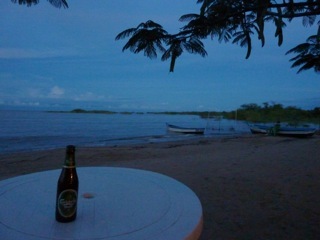 Usually I get there before dark so I can watch the evening over the lake, I have a beer or two, eat some fried chamba fish and cross back into Tz. the next morning. Traditionally there’s more than a little angst surrounding my visa runs, because there’s more than a little angst between me and Immigration. This has been going on since my first trip to Africa in 2003, I guess I’m just on their radar. Most times they try to get me to pay extra, sometimes I say the wrong thing, but there’s always something. I’m not sure Carlee will even cross a border with me again, and I don’t blame her a bit. Anyway, I was determined to make this run a smooth one. 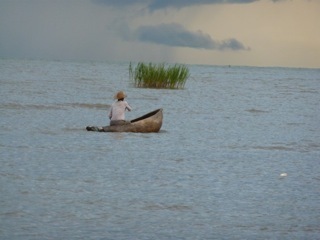 Local fisherman going to set nets. The trip to Malawi was uneventful, and while we waited in Tukuyu for passengers both human and fowl, I smelled nyama choma. Roast meat. There’s men here who make a living selling meat sticks, and they cook them on site with little portable barbecues.They cost 200 tsh, about 25 cents. They smelled divoon, and despite my promise never again in life to eat street meat, I had a few. Very tasty, not sure if it was beef or pork, but it was fingerlickin’ good and then the bus took off. Portable Barbecue. Nyama choma tamu sana. I arrived right on time, the lake was lovely and the fishing boats were out. It’s really beautiful. I had a cold Carlsbad, and took a mess of pictures. I ordered my fish and rice and went back to my room. 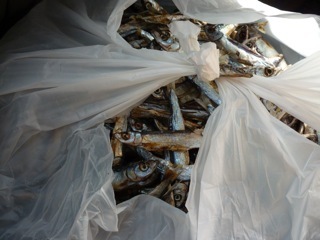 The fish came about an hour later, but it was very good, and I ate everything but the bones and eyes. Whether it was the meat or the fish, I’ll never know, but I spent a good part of the night washing sheets and running to the choo. Most third world travelers have their diarrhea and amoebic dysentery stories, and unless you have your own, it’s not too much fun listening to others. So I won’t go into details. Besides, this wasn’t a particularly interesting tale, my Losing Control Of My Bowels in Ghana story was much better. Siku nyingine (another day). Anyway, after a rocky night most of my angst during the return into Tz centered around whether or not I’d get across without humiliating myself at the visa stamping office. But zote was nzuri. As well as unwavering sphincter control, the border guard recognized me from 2 previous crossings in 2008 and grudgingly stamped my visa without once asking me for cash. I have been more joyfully remembered by other people, but oh well, an updated visa is an updated visa. 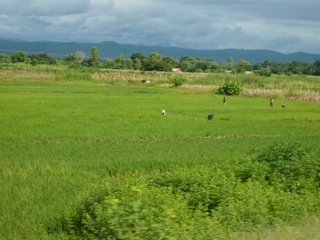 With my passport in hand and a song in my heart I continued on to Mbeya. I’ve got kids in school there, and other places, so it was time to check up on them, and pay school fees. 1. Batizo is doing very well at Mbalizi Nursing School and will graduate high in her class this July. She’ll be a trained midwife and will have no trouble finding a job. Asante Mungu. 2. The doc from Idweli is doing well in Iffakara. He’s a Clinical Officer but taking advanced training for 2 years so he can be a District Medical Officer and work in a hospital and perform surgeries. 3. Christina and Martha finished St. Aggrey School and are now enrolled in Shukrani International College in the Soweto district of Mbeya. They will study Business Administration and Office Management. I’m very familiar with this school, my friends Chris and David started it, and it has a good reputation. Their graduates get good jobs. 4. Violet, Ahadi and Rosie finished secondary school but didn’t do well on the exams, no surprise. I’ve talked enough about the schools here. But they hopefully will go to VETA, a govt. run vocational school, and will finish in 2 years, with a certificate, and be able to get work. 5. Ramadan did well on his exams and we will try to get him into a school in Mbeya where he will get a law certificate. This is the frst step toward being a lawyer. He’s a smart kid, so why not. The two small ones are hers. While I was in Mbeya, I stayed with my friends John and Kay, who are missionaries, but the down to earth kind. They’ve got a little Massai daughter they adopted from a very bad situation, as well as electricity, a real shower with hot water and a microwave. 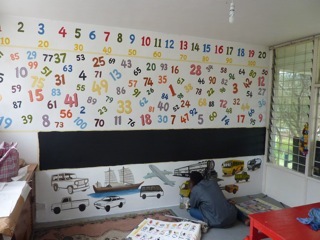 Kay also has a preschool in her house, so when she asked if I could find John Chota (the artist Carlee and I worked with in 2008-2009) I made a few calls and we started painting her chekechea. I’m back in Berega now, but John will finish her school then come to Berega to finish ours. When no one else is around I function as an artist, but when John is painting I usually do most of the prep work. It’s a waste of his talent, and he hates it. I don’t mind it too much, plus I get to watch and learn. This is why I do the prep work. My boats are recognizable as boats. I visited Idweli, the little village where I lived in 2005. 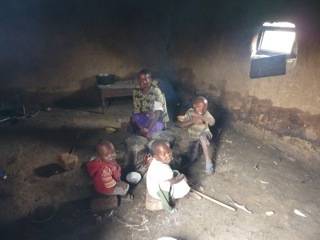 Amalie, one of the girls from the children’s center now has 2 kids, no husband and no job. So I made her a micro loan and she will make chapati and maandazi (fried dough balls eaten with chai). Mama Jackie (the doc’s wife) will advise her, and hopefully it will work out and maybe she can have a little restaurant or tearoom later on. It’s got to be better than what she’s got now. So after about 10 days I got homesick and returned to Berega. 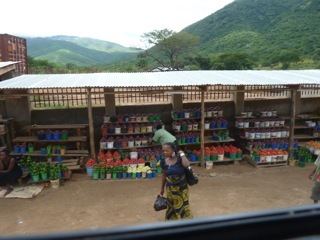 I rode up to Mbeya on Abood, a bus company I’d heard drove at a moderate rate, which was a lie. So I investigated a little and went with Sumry on the way home. They drove just as fast, if not faster, but the seats were nicer and they had a Bollywood movie (which you couldn’t hear over the roar of the bus engine but you can’t have it all). Where all the buses stop. your veggies on the way home. Mbeya is in the southern highlands, so while the ride up was often uphill, the ride home was downhill through the mountains. I tried to concentrate on the scenery, hoping it would distract me from the grinding of the brakes as we screamed around the curves (and the smell of burning rubber, don’t forget that). The view was outstanding. Most people don’t realize how the climate and environment varies in Africa. We passed through Mikumi National Park going up and back, and as it’s rainy season, there’s lots of grass and lots of animals eating it. I saw herds of zebra, giraffes and elephants.Tried to get good pictures, but at our rate of speed it’s not easy to get and/or stay focused. I never asked the driver to slow down, I figured he wasn’t too concerned whether we lived or died on the road so why should he care about the quality of my pictures. and stayed in my nose hairs for 3 days after. All the packages that you’ve sent have arrived, so we’ve got some fun stuff to play with on Monday when school starts. I’ve tried to teach the kids to say R and L, eventually gave up and started saying ara and elu, just to be understood. BUT when I was in Mbeya, I noticed that ALL the kids at Kay’s school can say both R and L properly so come Monday these kids are in for a surprise. It won’t be easy, these are village kids, not city kids, and many of Kay’s students come from Zambia, where they speak English. But in the end, I will prevail. It was good to come home, Africa is a very welcoming place, everyone was smiling and asking if I had a good likizo and Pesaka (Easter). Mama Freddy, one of my adult learners and mother of one of my preschool kids (Freddy) came to my house with a zawadi za Pesaka. An Easter gift. She brought me a chicken, a nice fat live one. She is keeping it for me at her house, as I am ill equipped to house fowl. But his housing won’t be an issue after tomorrow, because we’re going to eat him with rice. You need to understand how special it is to be given a chicken. Folks are poor here, and chickens are expensive, so I was very touched. 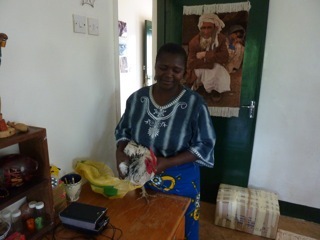 This is my second chicken, I was given one in Kyela a few years ago. That we will eat it together is even better. Isaac said there’s an old Swahili saying, Mgeni njoo, mwenyegi apone. Roughly translated it means the guest comes, the host benefits. As we will share the chicken, it’s a win-win. When I was a kid I wondered if I would even live to be this age and if so, what I would be doing. So at 60 I’m traveling and learning a new language and culture. Life is too good.